We’ve updated our Vegan Growth Portfolio model results with the data through March 1. We’ve updated our Vegan Growth Portfolio model results with the data through December 31. We’ve updated our Vegan Growth Portfolio model results with the data through December 3. We’ve updated our Vegan Growth Portfolio model results with the data through November 1. We’ve updated our Vegan Growth Portfolio model results with the data through September 30. We’ve updated our Vegan Growth Portfolio model results with the data through September 1. 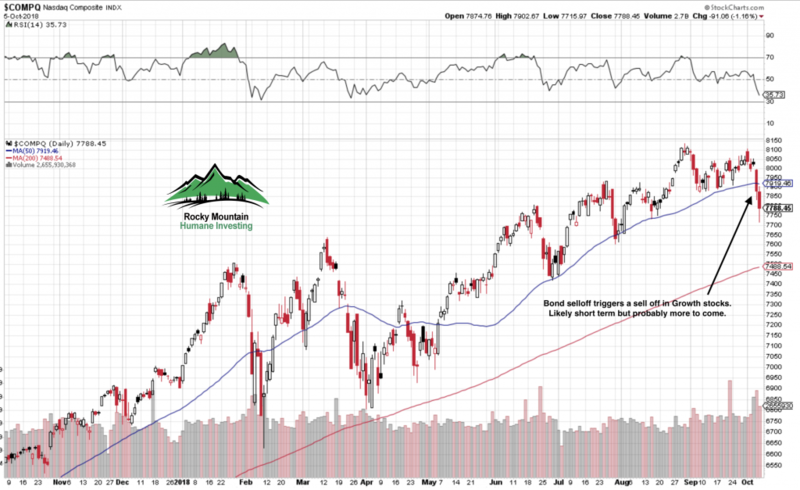 The VGP remains firmly ahead of the S&P 500. We’ve updated our Vegan Growth Portfolio model results with the results through August 1. The VGP remains ahead of the S&P 500. Summary: Last month I wrote about the Fed and what I expected could happen by the end of 2018 or early next year. My timing last month was too optimistic as things are coming to a head now. I expect the 3rd quarter to be volatile with a downward bias as the Fed and the European Central Banks (ECB) continue to destroy their economies and markets with policy errors. The world’s stock markets are in the process of crashing. It’s naive to think that the ripple effect will not happen here. Unless the Fed states that they’re going to pause raising interest rates or halting QT (see below), we can expect a market sell-oﬀ in the 15% range. This may be one of the reasons Trump tweeted that he asked the Saudis to increase oil production. There isn’t much inflation in the system right now except for energy prices. By increasing production with the hope of lowering the price of oil, it may be enough reason to for the Fed to halt rate hikes. But we really don’t know what the Fed will do at this point. At the start of last week, we had three big issues to contend with. 1) The rapid rise of the U.S. Dollar (USD) versus the Chinese Yuan. China does manipulate their currency against the U.S. as detailed in the chart below. Spikes in the USD/Yuan valuation in recent years have been catalysts for dramatic sell-oﬀs in U.S. stocks. Part of the problem is, in a world starved for short term yield, money is now being converting to USD to buy short term yields. In addition, the effect of QT (See below #3) is also a cause for the increase in demand for USD to buy Treasuries. Regardless of the reason, the devaluation of Chinese Yuan negates much of the tariff risk to China while also having a negative effect on the U.S. economy as U.S. goods become more expensive. Add tariffs to the mix and you can expect a significant slowdown in U.S. growth soon. The rise of the USD – caused by the Fed raising short term interest rates and investors liquidating short and intermediate term bonds – is causing Emerging Markets (EEM) to crash. The break below the EEM’s primary moving averages occurred at the same time the Fed most recently raised interest rates. 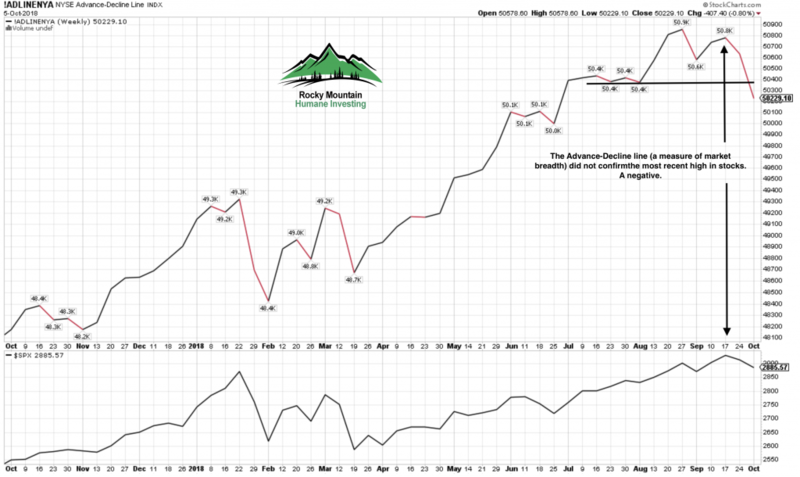 I had been watching the EEM exchange traded fund (ETF) along with its inverse ETF which rises as the EEM declines. We were able to make initial purchases in the $41-$43 zone. See below. I am using the EEV as a hedge against our current stock holdings. All of these international charts are in the Bear Market zone. The Yield Curve continues to decline and, unless the Fed stops raising short term interest rates, it should cross below the 0 threshold which will signal an incoming recession. For more on this click on the following link. In the chart above, the closer the Yield Curve gets to zero, the more nervous investors will become. The studies show the recession could be as long as a year or two following an inverted yield curve. But stocks move in anticipation of the future, and the Financial and Industrial stocks in the U.S. are moving into Bear Markets. We don’t need another banking crisis but that exactly what the banks are showing. Just brilliant timing by Congress to eliminate many of the restrictions after the 2008 debacle. The industrials have to contend with both trade wars and the Fed raising rates. They’re signaling that our present GDP growth is coming to a hard stop unless the Fed stops their behavior. High Yield Bonds – otherwise known as Junk bonds – can act like an early warning signal as they are a reflection of the risk in credit markets. If Junk bonds are selling oﬀ and Treasury bonds are rallying, that tells us there is trouble brewing as money exits risky credit for safe credit. High Yield is on the verge of signaling that credit markets could be become increasingly concerned about risk. Lastly we have QT. QT is the inverse of QE known as Quantitative Easing. After the collapse in 2008, the Fed and the ECB went on a series of actions (QE) whereby the Fed bought huge amounts of Treasury bonds in an effort to lower interest rates making stocks, treasuries, real estate etc… more attractive. In doing so, they created huge wealth for those who owned risk- oriented assets. However, the downside is that the Fed now owns a huge inventory of bonds and other securities and they have mandated that they must now begin selling oﬀ their inventory to “reduce their balance sheet”. 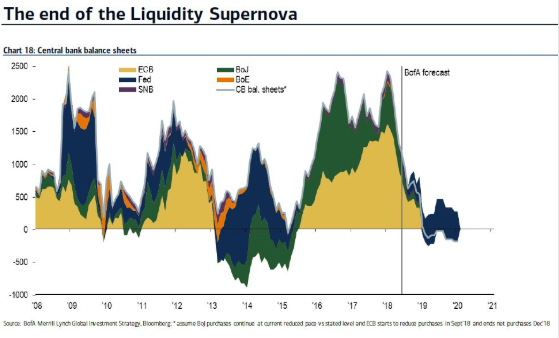 The liquidation on the open market by the Fed and the ECB is known as QT or Quantitative Tightening. When a central bank sells a security on the open market, the buyer is giving cash to the Fed in exchange for the security. On a mass scale, this reduces the amount of cash or USD in the system. The primary driving force in the stock market is the ebb and flow of cash in our economy, otherwise known as liquidity. When cash is coming into the system, it makes its way into the markets and drives prices higher. The inverse is also true but we’ve never actually experienced QT before. It could be a disaster on its own. But combined with rising short term interest rates, it could be lethal to the buy-and-hold long term investor. I’ve shown many charts that show the deterioration of the markets in the U.S. and abroad. In June, the Fed was selling off $30 billion in inventory a month and look at how much damage that created. Come this month (July), the Fed and the ECB will both be enacting QT. The Fed is scheduled to raise the amount of liquidation from $30 billion a month to $50 billion. I believe the Fed’s attempt to normalize interest rates is failing. My guess is that, at some point, the Fed will stop but the question is how much further damage will be done before they signal a white ﬂag. In the past two weeks, I’ve reduced our clients’ risk exposure greatly by adding inverse exchanged traded funds and adding Treasury bonds. Treasury bond prices should rally quite nicely if the Fed continues on its course of action as money moves to safety. Should there be further weakness in the S&P 500, I’d like to add inverse ETF’s based on the SP 500 as well. A break below 2670 would potentially signal a much further decline ahead. If you’re a new investor or have capital you’d like to add, this could be an opportunity for you, especially if we have a steep decline and the Fed backs off from rate hikes. What else could happen? The Chairman of the Fed is Jerome Powell and he will be under intense pressure to stop their present course. Pressure is not surprisingly coming from the White House as well as the Fed is a threat to kill the Presidents economic agenda. If Powell signals that the Fed is done with raising rates then a move to 3000 in the S&P 500 and a sharp sell oﬀ in long term treasury bonds is not impossible. Stay tuned. But my guess is there will be considerable damage done first. Powell was appointed by Trump and it’s my understanding he can be fired as well. A firing would be considered a major positive event for risk markets. Time will tell and this period will pass as well. It’s a time to be very cautious and hedged against risk. We are positioned to protect our client accounts and beneﬁt if a major decline occurs. The irony of all of this is I didn’t even mention Trade Wars. But they’re easy to win so it’s all good.